How do you keep on top of your workload? When the emails and to-do tasks pile up, how do you manage to keep afloat? I am always keen to hear how others manage the information of their day and their responsibilities. The strategies they use, the workflows they choose. Are they thriving or surviving? For me, I have tried a range of strategies and bounced between them trying to find the flow that would allow me to get through a busy time. This is the workflow that I keep coming back to. Trello is the key to managing my workload. Why? It works on all devices. You can set up the lists any way you like and the drag and drop functionality make it easy to move items around. I have played around with a few list structures. I used a priority matrix structure for a while. With the priority matrix structure, I had six lists in Trello. The first list was called To be categorised. This list is where I placed all tasks to begin with. The next four lists made up the priority matrix – Do Now, Do Next, Do Later, Don’t Do. The sixth list was titled Done. This structure worked for me for a while but I found the six lists increased my categorisation time and not my productivity. The standard set up for Trello is the Kanban system and this is for me the best out there. It is made up of three lists. A To Do list, a Doing list and a Done list. I just love the simplicity of Kanban and find it really sharpens by focus. Doug Belshaw writes extensively about Kanban and Trello and you really should check out his Kanban 101 Open badge. I still have a paper to do list that I use all the time but I find it more a place to scrawl and take quick notes then a way to organise. Once I have written down my notes or tasks, I transfer them to Trello to hone my focus. This helps when I spend extensive time away from my desk. Through listening to the TIDE podcast (Today in Digital Education) by Doug Belshaw and Dai Barnes (an absolutely brilliant podcast), I was introduced the Pomodoro technique and this coupled with Trello has revolutionised my work habits. The Pomodoro technique is a way of working with time as opposed to against it. Basically you work on one task for a timed 25 minutes and then take a 5 minute break. 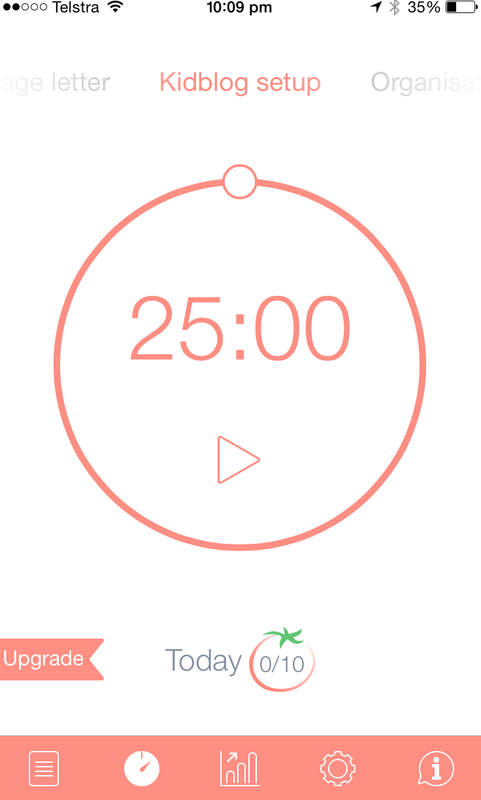 You can repeat the Pomodoro for the previous task or change the task completely. To assist me to stay on time, I downloaded an app and use that to manage my Pomodoros. You can find out more about the Pomodoro technique here. When I start my day, it starts with my Trello list. I list the items that I am going to work on first. I then input these into my Pomodoro app and then I get to work. I have found that this has really improved my work output and also increased my time away from a screen. During my five minute break, I go for a walk, talk to a colleague, get a coffee whereas previously I would just try to work through. This often would lead to distraction or just bouncing from task to task without actually getting stuck into any one. I thoroughly recommend that you check out both Trello and Pomodoro. What is your workflow like? I would love to hear from you. Thanks Summer, they are the engine of my productivity! !